VW's MAN unit will build electric buses. HAMBURG -- Volkswagen Group is flanking its push into electric cars with plans to roll out battery-powered commercial vehicles targeted at urban areas as growing public concerns about air quality boost demand. The Volkswagen Truck & Bus division will invest 1.4 billion euros ($1.7 billion) in new technology including electric drivetrains, autonomous systems and cloud-based software, Andreas Renschler, head of the unit, said Wednesday in an interview here. VW Group's U.S. affiliate Navistar International will adopt some of the systems, while the company's MAN and Scania nameplates will both deliver full-electric buses next year to European cities, adding to bio-diesel, hybrid systems and natural-gas line-ups. "We believe in a wide range of alternative powertrains and fuels, depending on local availability, social and local demand and customer requirements," Renschler said at a press event. "Therefore it is crucial that policy makers adopt a technology-neutral approach" in any regulations. Electric trucks for local deliveries will probably exceed a 5 percent market share by 2025, according to Renschler. That compares to a forecast of about 25 percent for battery-powered cars. Commercial-vehicle manufacturers have been slow to develop electric models as loads are heavier and they serve a wider range of industries. Complicating matters is that trucks already vary significantly across the globe because of differences in regulations, making it difficult to build vehicles in large enough volumes to generate economies of scale. While in the aftermath of Volkswagen’s emissions-cheating scandal, some municipalities are looking at banning diesel engines to reduce air pollution. German competitor Daimler, the world’s largest commercial-vehicle producer and Renschler’s former employer, has stepped up development of engines including full-electric and hybrid versions as well as digital services to defend its lead. 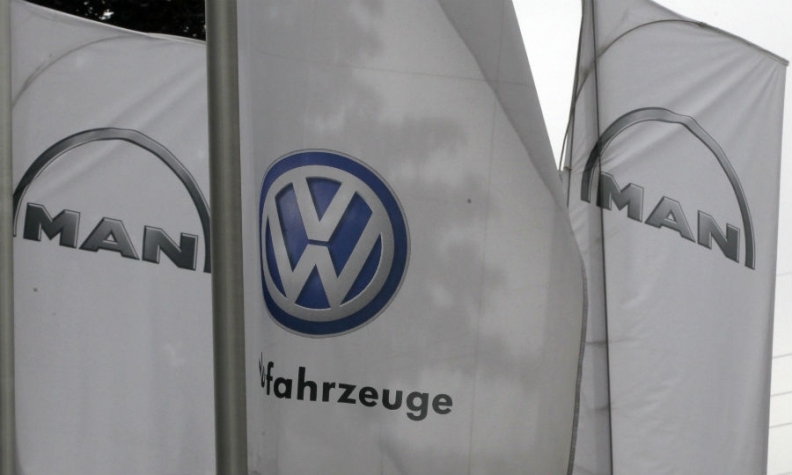 Volkswagen is also facing new rivals such as Tesla, which is unveiling of a battery-powered semi truck on Nov. 16. Better battery technology will be key to making electric trucks more attractive by lowering operation costs, Renschler said. In addition to higher prices for the systems and recharging challenges, the power packs “are heavy and room-stealing,” reducing the capacity for carrying loads, Renschler said. “With city buses, we are just hitting the break-even point compared to conventional solutions,” Renschler said. “Electric distribution trucks are expected to turn positive in 2020-25,” while battery-powered long-haul heavy vehicles will be “late” in turning a profit for their owners. VW Truck & Bus’s autonomous-driving technology is focused on closed environments, such as snow plows at airports or transport shuttles on set routes in parking lots or factories. VW plans to be ready for commercial production of the models within two years. Engineers are already working with customers to refine technology and gain experience. Success with those models, as well as services including new software to efficiently manage cargo, will determine whether VW’s push to forge a global truckmaking powerhouse with an operating return on sales averaging 9 percent will gain traction. Renschler said VW is keeping all options open to expand the business, including a possible share sale. He’s also looking at increasing the 25 percent stake in China’s Sinotruk Hong Kong Ltd. that MAN holds as well as widening cooperation with GAZ PJSC in Russia and Navistar in the U.S., where Daimler’s Freightliner brand is the market leader.